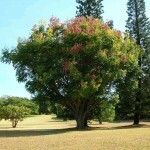 Feathery compound foliage of bipinnate golden raintree is accentuated by airy clusters of yellow flowers in summer, and papery, pinkish tan seedpods soon thereafter. A rounded deciduous tree with an irregular branching habit with cracking gray bark, it hails from southwestern China. The leaves are bi-pinnately compound - a central leaf stem petiole branches again into lined stems of long, pointed, tooth-edged, bright green leaflets. Emerging leaflets are light green with a coppery cast. In late summer thin, wispy-stemmed clusters of yellow flowers arise from branch tips creating a lovely display above the dark green foliage. The individual flowers are small, four-petaled, and have a tiny orange speck at the petal bases. The pods that quickly form after being pollinated by bees are papery, three-chambered pods that are often called "Chinese lanterns", dangling from the branches. They are rosy-pink when young, gradualy drying to be more a pale rosy-tan. 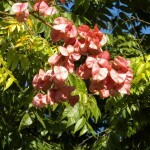 A tree filled with the pods is perhaps as pretty as when in flower, but is certainly a differently textured display. The seeds readily germinate around the base of the tree, leading to weedy seedlings in the landscape. In fall the foliage can turn a quickly turn an inconsistent yellow before dropping. Bipinnate golden raintree is tolerant of many conditions and are great urban trees tolerant of pollution, heat, salt and drought. 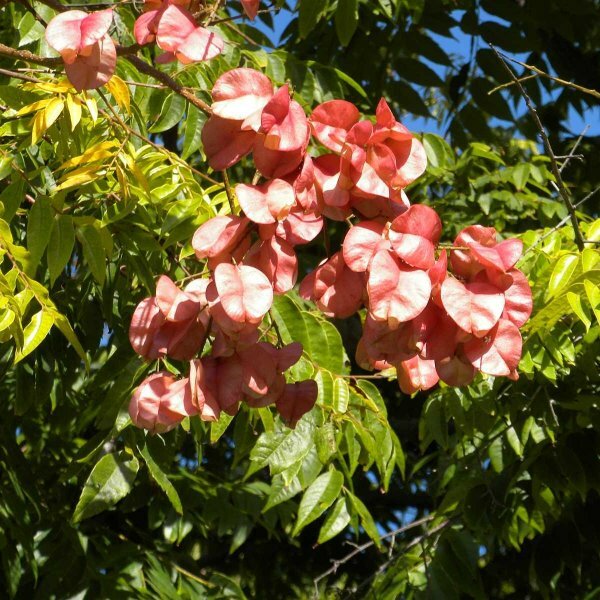 It excels in well-drained soil and full sun but will grow in partial shade. It has an open, rangy, leaning habit and brittle wood which breaks during windstorms or from heavy snow or ice. Prune while young to establish good branch structure and a tidy shape. 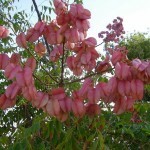 The seeds of this tree are fertile and pop-up around the landscape. It is great in providing broken shade to patios, as a street tree or in small yards and landscapes, although quite messy. Germination 1. Pre-soak seed for 24 hours in hot water. If they swell up then sow in a cold frame. If they do not swell then soak it for a further 24 hours in hot water (50°C / 120°F) prior to sowing. This should cause the seed to swell but, should this fail, scarification followed by a further 24 hours in warm water should do the trick. To “scarify” the seed take a sharp knife, file or sandpaper and cut or file the hard seed coat away. Do it gently, until you see the white inner of the seed. This will allow water to penetrate the seed itself. Take care not to damage the seed embryo, or your fingers! 2. The seed need to go through the cold of winter to germinate. If sowing in the autumn or winter, sow into 7.5cm (3in) pots, cover the seeds with 5mm (¼”) of soil and a sprinkling of fine grit and place them in a sheltered position in the garden. The compost should be kept moist but not wet at all times. 3. Some seeds will germinate in 3-4 weeks; others may germinate over an extended period. Check them from time to time and pot seedlings into larger pots as they become large enough to handle. Keep an eye on them, they grow quite fast and will need potting on sooner than you think! If you are sowing at any other time of year, you can imitate the seasons by “cold stratification”. Place the seeds in a small plastic bag or container (film cartridges are good) fill with slightly moist sterilized peat moss or vermiculite and spray with a fungicidal product to help prevent mildew. Place the bag or container in the refrigerator (not freezer) for 12 weeks. Check seeds periodically, if they are germinating, sow immediately as above. Planting out should be done in late spring. After the last expected frosts, as although hardy, they are susceptible to frosts when young.